Computer simulations and mathematical models which have been developed to emulate the flocking behaviors of birds can also generally be applied to the "flocking" behavior of other species. As a result, the term "flocking" is sometimes applied, in computer science, to species other than birds. Flocking behavior was simulated on a computer in 1987 by Craig Reynolds with his simulation program, Boids. This program simulates simple agents (boids) that are allowed to move according to a set of basic rules. The result is akin to a flock of birds, a school of fish, or a swarm of insects. The basic model has been extended in several different ways since Reynolds proposed it. For instance, Delgado-Mata et al. extended the basic model to incorporate the effects of fear. Olfaction was used to transmit emotion between animals, through pheromones modelled as particles in a free expansion gas. Hartman and Benes  introduced a complementary force to the alignment that they call the change of leadership. This steer defines the chance of the bird to become a leader and try to escape. Hemelrijk and Hildenbrandt  used attraction, alignment and avoidance and extended this with a number of traits of real starlings: first, birds fly according to fixed wing aerodynamics, while rolling when turning (thus losing lift); second, they coordinate with a limited number of interaction neighbours of 7 (like real starlings); third, they try to stay above a sleeping site (like starlings do at dawn), and when they happen to move outwards from the sleeping site, they return to it by turning; fourth, they move at relative fixed speed. The authors showed that the specifics of flying behaviour as well as large flocksize and low number of interaction partners were essential to the creation of the variable shape of flocks of starlings. 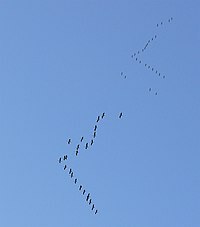 Measurements of bird flocking have been made using high-speed cameras, and a computer analysis has been made to test the simple rules of flocking mentioned above. It is found that they generally hold true in the case of bird flocking, but the long range attraction rule (cohesion) applies to the nearest 5-10 neighbors of the flocking bird and is independent of the distance of these neighbors from the bird. In addition, there is an anisotropy with regard to this cohesive tendency, with more cohesion being exhibited towards neighbors to the sides of the bird, rather than in front or behind. This is no doubt due to the field of vision of the flying bird being directed to the sides rather than directly forward or backward. Another recent study is based on an analysis of high speed camera footage of flocks above Rome, and uses a computer model assuming minimal behavioural rules. In flocking simulations, there is no central control; each bird behaves autonomously. In other words, each bird has to decide for itself which flocks to consider as its environment. Usually environment is defined as a circle (2D) or sphere (3D) with a certain radius (representing reach). bin-lattice spatial subdivision. Entire area the flock can move in is divided into a large number of bins. Each bin stores which birds it contains. Each time a bird moves from one bin to another, lattice has to be updated. Example: 2D(3D) grid in a 2D(3D) flocking simulation. Lee Spector, Jon Klein, Chris Perry and Mark Feinstein studied the emergence of collective behavior in evolutionary computation systems. Bernard Chazelle proved that under the assumption that each bird adjusts its velocity and position to the other birds within a fixed radius, the time it takes to converge to a steady state is an iterated exponential of height logarithmic in the number of birds. This means that if the number of birds is large enough, the convergence time will be so great that it might as well be infinite. This result applies only to convergence to a steady state. For example, arrows fired into the air at the edge of a flock will cause the whole flock to react more rapidly than can be explained by interactions with neighbors, which are slowed down by the time delay in the bird's central nervous systems—bird-to-bird-to-bird. 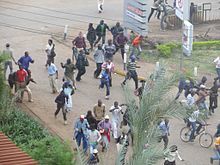 Flock-like behavior in humans may occur when people are drawn to a common focal point or when repelled, as below: a crowd fleeing from the sound of gunfire. In Cologne, Germany, two biologists from the University of Leeds demonstrated a flock-like behavior in humans. The group of people exhibited a very similar behavioral pattern to that of a flock, where if 5% of the flock would change direction the others would follow suit. When one person was designated as a predator and everyone else was to avoid him, the flock behaved very much like a school of fish. Flocking has also been considered as a means of controlling the behavior of Unmanned Air Vehicles (UAVs). Flocking behaviour has been used for other interesting applications. It has been applied to automatically program Internet multi-channel radio stations. It has also been used for visualizing information and for optimization tasks. ^ O'Loan, OJ; Evans, MR (1999). "Alternating steady state in one-dimensional flocking". Journal of Physics A: Mathematical and General. IOP Publishing. 32 (8): L99. arXiv:cond-mat/9811336. Bibcode:1999JPhA...32L..99O. doi:10.1088/0305-4470/32/8/002. ^ Reynolds, Craig W. (1987). "Flocks, herds and schools: A distributed behavioral model.". ACM SIGGRAPH Computer Graphics. 21. pp. 25–34. ^ Delgado-Mata C, Ibanez J, Bee S, et al. (2007). "On the use of Virtual Animals with Artificial Fear in Virtual Environments". New Generation Computing. 25 (2): 145–169. doi:10.1007/s00354-007-0009-5. ^ Hartman C, Benes B (2006). "Autonomous boids". Computer Animation and Virtual Worlds. 17 (3–4): 199–206. doi:10.1002/cav.123. ^ Hemelrijk, C. K.; Hildenbrandt, H. (2011). "Some Causes of the Variable Shape of Flocks of Birds". PLOS ONE. 6 (8): e22479. Bibcode:2011PLoSO...622479H. doi:10.1371/journal.pone.0022479. PMC 3150374. PMID 21829627. ^ Feder, Toni (October 2007). "Statistical physics is for the birds". Physics Today. 60 (10): 28–30. doi:10.1063/1.2800090. ^ Hildenbrandt, H; Carere, C; Hemelrijk, CK (2010). "Self-organized aerial displays of thousands of starlings: a model". Behavioral Ecology. 21 (6): 1349–1359. doi:10.1093/beheco/arq149. ^ Hemelrijk, CK; Hildenbrandt, H (2011). "Some causes of the variable shape of flocks of birds". PLOS ONE. 6 (8): e22479. Bibcode:2011PLoSO...622479H. doi:10.1371/journal.pone.0022479. PMC 3150374. PMID 21829627. ^ Spector, L.; Klein, J.; Perry, C.; Feinstein, M. (2003). "Emergence of Collective Behavior in Evolving Populations of Flying Agents". Proceedings of the Genetic and Evolutionary Computation Conference (GECCO-2003). Springer-Verlag. Retrieved 2007-05-01. ^ "http://psychcentral.com/news/2008/02/15/herd-mentality-explained/1922.html". Retrieved on October 31st 2008. ^ Senanayake, M., Senthooran, I., Barca, J. C., Chung, H., Kamruzzaman, J., & Murshed, M. "Search and tracking algorithms for swarms of robots: A survey." ^ Gabbai, J. M. E. (2005). "Complexity and the Aerospace Industry: Understanding Emergence by Relating Structure to Performance using Multi-Agent Systems". Manchester: University of Manchester Doctoral Thesis. ^ Ibanez J, Gomez-Skarmeta AF, Blat J (2003). "DJ-boids: emergent collective behavior as multichannel radio station programming". Proceedings of the 8th international conference on Intelligent User Interfaces. pp. 248–250. doi:10.1145/604045.604089. ^ Moere A V (2004). "Time-Varying Data Visualization Using Information Flocking Boids" (PDF). Proceedings of the IEEE Symposium on Information Visualization. pp. 97–104. doi:10.1109/INFVIS.2004.65. ^ Cui Z, Shi Z (2009). "Boid particle swarm optimisation". International Journal of Innovative Computing and Applications. 2 (2): 77–85. doi:10.1504/IJICA.2009.031778. Cucker, Felipe; Steve Smale (2007). "The Mathematics of Emergence" (PDF). Japanese Journal of Mathematics. 2: 197–227. doi:10.1007/s11537-007-0647-x. Retrieved 2008-06-09. Shen, Jackie (Jianhong) (2008). "Cucker–Smale Flocking under Hierarchical Leadership". SIAM J. Appl. Math. 68 (3): 694–719. arXiv:q-bio/0610048. doi:10.1137/060673254. Retrieved 2008-06-09. Fine, B.T. ; D.A. Shell (2013). "Unifying microscopic flocking motion models for virtual, robotic, and biological flock members". Auton. Robots. 35 (2–3): 195–219. doi:10.1007/s10514-013-9338-z. Vásárhelyi, G.; C. Virágh; G. Somorjai; T. Nepusz; A.E. Eiben; T. Vicsek (2018). "Optimized flocking of autonomous drones in confined environments". Science Robotics (published 18 July 2018). 3 (20): eaat3536. doi:10.1126/scirobotics.aat3536. Wikimedia Commons has media related to Swarming. Another Flocking Simulator - A simple flocking applet which lets you control a number of parameters to create flocks that behave like birds, insects, bacteria, etc. NetLogo, a free software for multi-agent modeling, simulation, and the like, including a flocking simulation.